HD2 With a Sliding Keyboard? 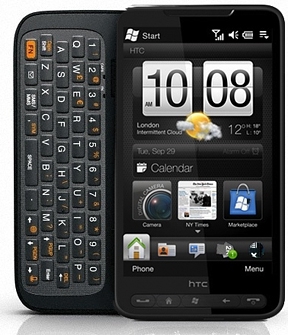 "The HTC HD2 may soon be available with a side-sliding keyboard. Or so says Xmoo, a ROM collector, who has found evidence for such a HD2 version." If there's one thing I dislike, it's when a phone feels like a brick - and one of the things I like most about the HD2 is how slim it is. If HTC puts a keyboard on it, that brick-like feeling might pop-up...unless the added overall size of the HD2 gives HTC the space they need to keep it slender. Would you like an HD2 with a sliding keyboard? It all depends by how HTC will implemented: I do not mind the size of my HD2 because is very thin; same size and thickness closer to a Touch Pro 2....... not for me. I'd be interested, but at this point only if it were guaranteed to run WP7. I really like the sliding keyboard because I often spend a lot of my time entering text. Soft keyboards never seem to work well for me. I'm not as concerned about the thickness, though. I don't want 2 inches, but an inch overall may be bearable. Less is obviously better, especially since they'd have the room to expand outward rather than making the device too much thicker. I guess time will tell on this, though. If it can't go to WP7 officially, I'm probably not as interested. I've been waiting for Zune support for some time and feel that WP7 has a lot of potential, even if it won't all be realized at release. I'd love to hear more about this if and when details are revealed. As a TP2 owner, the main reason I haven't looked at the HD2 is the lack of a hardware keyboard. I really don't get the whining about size, but then again, I'm more concerned about functionality then fashion statements and as long as I can hook it on my belt without pulling my pans off, I'm fine. I've tried software keyboards, from the iphone to swype on winmo, and nothing beats a physical keyboard for the amount of typing I do. Honestly an HD2 with the tp2 keyboard would be the perfect phone. I've liked the HD2, but I will only buy phones with a physical keyboard. I can't stand the virtual keyboard on my Touch Pro 2 and always use the slider. However, I think MS is so far off with WP7, I think I'll wait for an Android with a slider keyboard. It's safe to bet that Iphone will never allow a physical keyboard. The one thing I have missed about decent phones is a keyboard. Web browsing, keying in passwords, and even texting are second best on screen. I really miss my psion 3 and 5, whic managed a fabulous keyboard in a small space. What HTC would need to do is make sure that it came with a bigger battery so there was a chance of a couple of days usage, or even being able to use it for gps walking. I was very happy to carry around my HP hx4700 (AND A PHONE AS WELL) for years, and that is much bigger and heavier than the HD2.